This is our review for the Body Merry Stretch Marks and Scars Defense Cream. The rich formula by Body Merry offers a natural healthy product, which claims to fight the appearance and colouration caused by stretch marks and other scarring, as well as hydrating the skin, and adding a vitamin boost to help to protect against future scarring. This is an impressive list of natural oils, butters, and apparently even plant stem cells included with your 4oz pot of skin cream. It really is a nice formula. The recommendation is that you apply it twice daily, to clean, dry skin. There is no particular limit for how much to apply, just make sure it all sinks in. If your skin stops absorbing it, then you probably have used too much. It’s hard to recommend by measurement as the size of the scarred area varies for everyone. 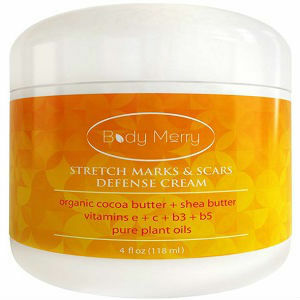 It’s a good deal to pay only $20 for the Body Merry Stretch Marks and Scar Defense Cream. We haven’t been able to find any discounts or promotions for the Body Merry cream. Body Merry say they understand that beauty is very particular, and what works for one might not for another. For this reason they say, they offer a 90 day money back guarantee if you’re not absolutely satisfied with the results. Because stretch marks are particularly noticeable, it’s very easy to quickly see if the cream is having an effect or not. The value is great for such a healthy, all natural beauty product like this one. And it does come with a guarantee. One drawback however would be that we couldn’t really find much information on possible side-effects, not on their website nor anywhere else on the packaging. It only comes in one tiny size, which might run out pretty quickly if you use two times per day. Also it might be worth mentioning that some of the online customer reviews do seem less than impressed with the results. As a result, it might be best to keep shopping around for skin care products instead of quickly deciding on Body Merry cream. David Carney	reviewed Body Merry Stretch Marks and Scars Defense Cream	on August 4th	 and gave it a rating of 3.